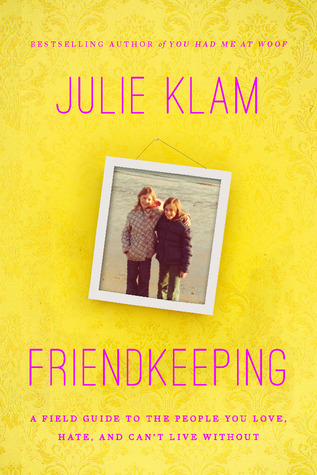 I just finished reading Friendkeeping by Julie Klam. The book took me longer to read than normal because there was so much in it that got me thinking. To me, this is the sign of a good book; it makes you think. Klam’s book speaks to women about their relationships with other women. As I read the book, I found myself thinking of the many female friends I’ve had over the years. Nodding my head, I had to agree with Klam’s insights. The book is humorous and I liked that. Friendships often help us along the journey of life. Good or bad, we learn not only about others, but about ourselves in the process. I am glad I read this book at this particular time in my own life. Lately I’ve been imagining what I will write to many friends scattered across the globe in my yearly holiday recap letter. I wish I could send them all a copy of Friendkeeping. After reading this fine book, I will put an extra effort into the letter to convey to my dear friends just how important they are to me. This entry was posted in Uncategorized and tagged Books, Friendkeeping, friendships, Julie Klam, women. Bookmark the permalink.